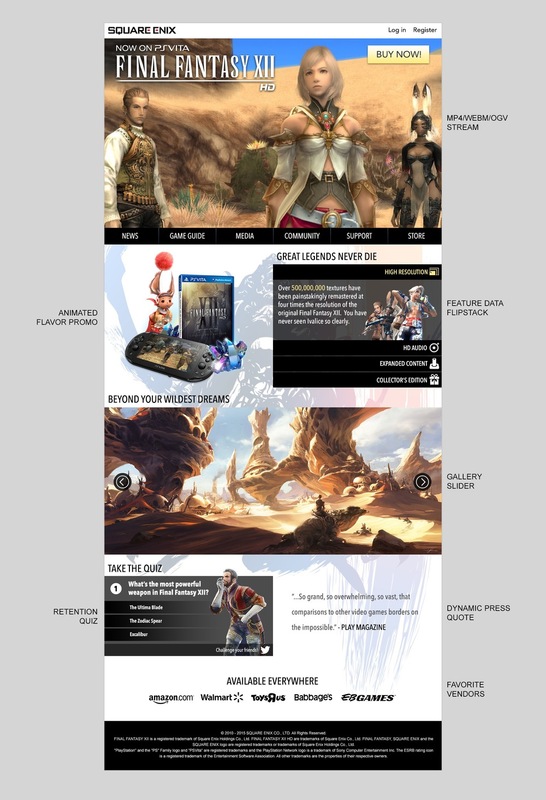 I recently entered a web design challenge with a goal of designing a site for my favorite video game. I have lots of favorite games, but I've been listening to the Basiscape/Hitoshi Sakimoto score for Final Fantasy XII a lot for the past few years and I love the world of Ivalice, especially as portrayed by Final Fantasy XII, so that's what I picked. I started with some thumbnails of three design directions. I called the first one "Traditional" because it's like the most standard three-column site layout I could think of. I wanted to prove that I know what it is to do a "regular" website, but I also already knew I wasn't going to pick this. The second design I called "Parallax" because I was planning to use depth speeds on the content layers, but ultimately I decided that's too trendy, and also has nothing to do with the game content. The final design I called "Cinema." "Traditional" and "Parallax" turned out to pretty much just be warmups for me, because I really fell hard for "Cinema." I was running out of time by the time I did that version, too, so I went with it. Here's the full-page view of the "Cinema" design. My goal for this design was to be modern, but not too flashy. I wanted the game content to be central. I also wanted the header image to be a variable-width HTML5 video stream that would work all the way down to mobile dimensions.